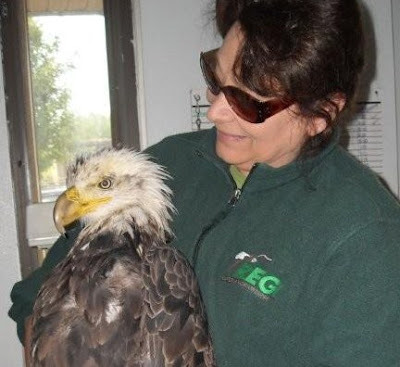 Taking Flight: Lead Poisoned Bald Eagle Update!! First the news that everyone is waiting for! 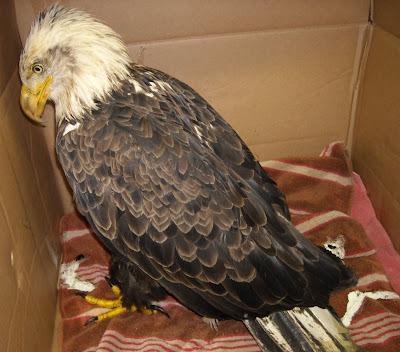 I am very happy to report Bald Eagle from Post Lake, is still with us and doing better. We are cautiously optimistic now for her continued recovery. I say cautiously optimistic because with the very high lead levels that this eagle had when admitted, so many other things could go wrong still. Her heart could be affected, her brain, her liver or her kidneys. Lead is a nasty toxin. For so long our own population was affected with lead poisoning. The lead analyser we have here at REGI was actually developed for use in human children. Our eagle is now on her second round of CA EDTA and while she is not "happy" about life she is alive and has the focus to KNOW she is unhappy. When she was admitted she was not aware of her surroundings and remained that way for a few days. She convulsed and was unable to eat whole food. When she did try a small piece she threw it up. We had to tube feed her liquid food during her worst period. Some folks asked what I meant when I talked about "rounds" of CaEDTA shots. We do two shots a day for the first four days. Then take another blood test. If the test is in lower levels we stop the shots for four days. 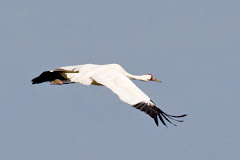 AT that point the blood has once again picked up lead from the bones of the birds ( where it is stored) and it is in the blood stream. At the end of the days off the shots the birds are once again beginning to show signs of lead poisoning. We start the shots again and do the same routine once more. The number of "rounds" will depend on the severity of the lead poisoning. The treatment is intense for both the bird and the rehabilitators. In severe cases we can go through months of this kind of critical care. We x-ray the bird early on to make sure there is no free lead pieces in their digestive system. Sinkers are a big problem with birds like osprey and bald eagles. They may catch a fish that swallowed a sinker in the past. Once the bird eats that fish, the lead poisons the bird. we did to remove the lead from the blood stream. So, for now the eagles blood lead is once again high and she is on shots twice a day and will be the next several days. But she is eating and she is digesting and she is aware she is not in the wild. That is not OK with her, but until she is 100% better and fully exercised she will be our guest at REGI. It seems a complicated procedure to have to navigate. Lead poisoning could be pretty much eliminated if it was banned from fishing tackle and ammunition. That will happen, but old habits die hard and people don't seem to get it. It is hard from me to consider that a known toxin is still being used by the general public. Many more patients have been admitted each day. 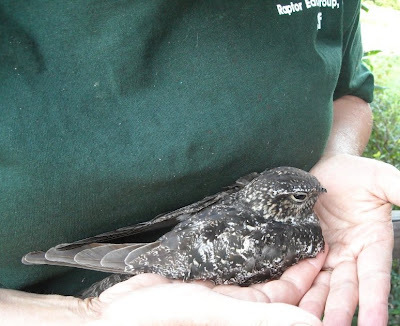 We've had a run of nighthawks admits as this is migration time through our region. For some reason several woodpeckers have also come in and a kingfisher as well as more robins and a peregrine falcon just arrived as well. It is a busy time here and now without the extra hands our interns provided. We miss them. ::((( Keep us in your thoughts.